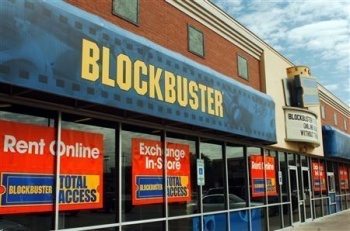 Blockbuster Video may be broke, but one executive is claiming that videogame publishers still love his company. Even though Blockbuster Video is a shell of its former self, with only a fraction of stores still open around the world, it's apparently still a darling in the eyes of game publishers. Why? Because "it takes away from trade-ins." Speaking to MCV, Blockbuster's commercial director Gerry Butler explained that since his company draws customers away from buying used games. Over in Britain, Blockbuster is starting to heavily promote its game rental service, which it's recently overhauled. Should you rent a game from the company, you're no longer charged late fees; instead, you can just extend your rental for Â£1 a day. Additionally, if you've rented a game and then decide to buy it, Blockbuster will discount you the rental fee you've already paid. "We have ramped up the rental side of our business and we have got an awful lot of support from publishers. Publishers like renting as it takes away from trade-ins. The problem with trade-ins is the publisher doesn't get any money. The advantage of renting is that they get quite a lot of money." Butler's comments certainly seem to make sense, but I'm not sure he realizes that used games will always be a tantalizing offer for gamers. Sure, renting a game isn't a bad way to try it out, but if Blockbuster is selling the titles at premium prices (if they're anything but new) then it's probably safe to assume that trade-ins will sell for less.